Tulsi is an herbal remedy used in Ayurvedic medicine, which is an ancient form of traditional medicine developed in India. The herb is similar to other kinds of basil in terms of looks and taste. 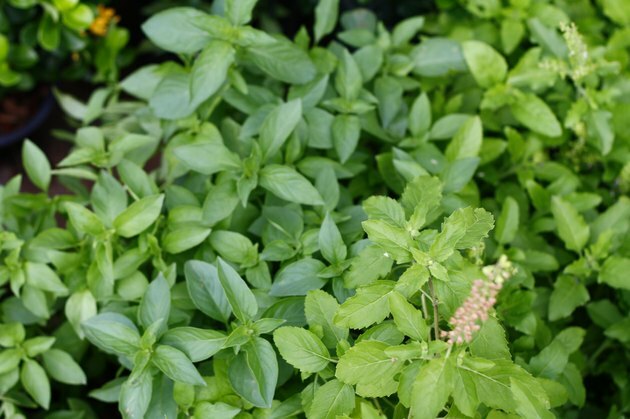 Tulsi is used to flavor Indian cuisine, but it’s valued mostly for its medicinal properties. One of its medicinal properties is strong adaptogenic behavior, which influences hormone function and balance. Consult an herbalist or practitioner of Ayurvedic medicine about the potential benefits and side effects of taking tulsi. Tulsi, also known as Ocimum sanctum, or holy basil, has been used medicinally in India for at least a few thousand years. Due to its reputation of improving a wide-spectrum of ailments, conditions and symptoms, tulsi is also nicknamed the “Queen of Herbs” in most regions of India. Tulsi displays many medicinal properties and is commonly used as a natural antioxidant, antimicrobial, anti-inflammatory and adaptogen. Adaptogens are substances that have the ability to reduce stress levels by boosting immune response and balancing hormone levels. Hormone imbalance is a cause of many symptoms and conditions, especially those that afflict women as they age. Menstrual problems, fatigue, weight-gain, mood changes, reduced libido, hot flashes, insomnia, inflammation and diffuse musculoskeletal pain are common symptoms of hormonal imbalance. Hormones are produced by glandular tissue, such as the thyroid, pancreas and adrenal glands, which are sensitive to dietary toxins, radiation, disease conditions and stress. Damaged or diseased glands result in hormone imbalance, which always leads to symptoms sooner or later. There are many types of hormones circulating in your body, but cortisol is the primary stress hormone. Cortisol is released by the adrenal glands, which sit atop your kidneys, during bouts of emotional or physical stress. Adaptogens such as ginseng and tulsi help reduce the biochemical developments of stress by balancing cortisol levels, according to “Natural Standard Herb & Supplement Reference: Evidence-based Clinical Reviews.” Specifically, too much cortisol affects the thyroid gland, ovaries and pancreas, so tulsi is able to impact the functioning of these glands secondarily. For example, too much cortisol can cause an imbalance of insulin secretion from the pancreas, which can lead to hypoglycemia or hyperglycemia. However, tulsi can help balance blood glucose levels indirectly by regulating cortisol secretion. Furthermore, tulsi may impact the secretion of neurotransmitters in the brain, such as serotonin and dopamine, which help regulate mood and mental well-being. Tulsi can be purchased in capsule form, although many Ayurvedic practitioners recommend consuming it as an herbal infusion or tea. Fresh leaves are best, although ready-made tea bags are a convenient substitute. When making tulsi tea, or any herbal tea, refrain from using boiling water because some plant compounds are destroyed at high temperatures. Exercise caution with tulsi capsules or tea if you are pregnant or trying to get pregnant because the herb affects hormone levels.